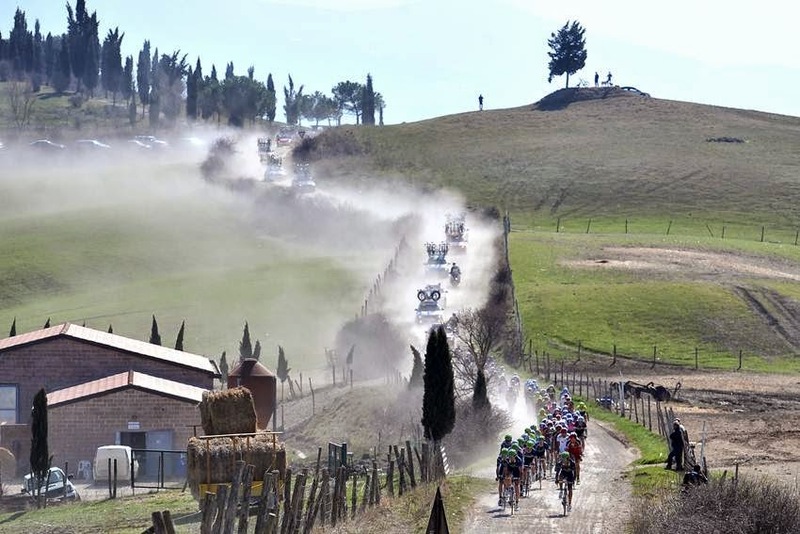 The name of the race has now been changed to Strade Bianche Eroica Pro from Strade Bianche (the name in use since 2009; when the race began in 2007 it was named Montepaschi Eroica). The race was originally born in 1997 on the roads of L’Eroica, a non-competitive cycling event on historic bikes with the goal of reviving old time cycling, riding on a course that predominantly uses the white gravel roads of the Siena region. Note that this year will also be the first time there will womens race, read more here. 50km of 'white road' in ten sections, with stretches rated '5 stars' for difficulty. The peloton will take on an extremely hilly race route at the famous ‘Strade Bianche’. The race may lack long climbs, but in their place it offers a long series of formidable inclines, some of them tremendously steep. What makes this race distinctive is the inclusion of approximately 50km of dirt tracks, the famous White Roads or ‘Strade Bianche’, which is divided into ten sections. The White Roads are compacted into a hard, durable surface with a small amount of loose gravel and largely free of vegetation. 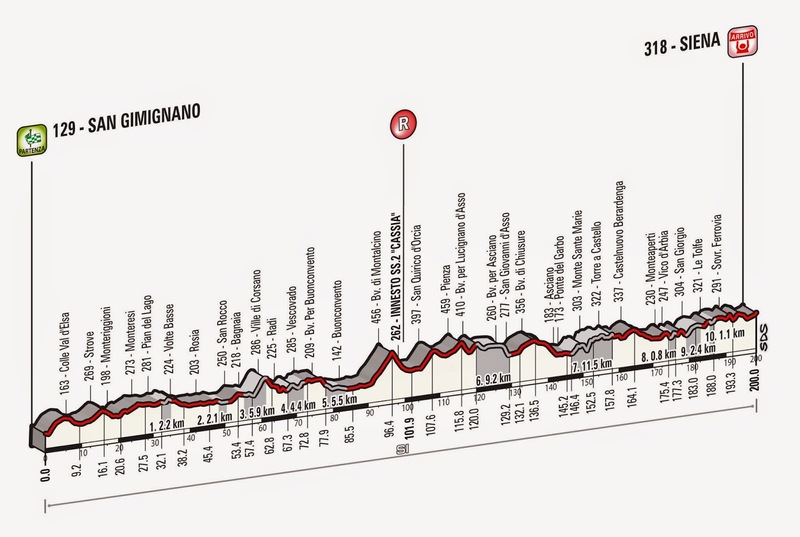 From the race start, at San Gimignano, the first 33km is on rolling, asphalted roads. The route passes close to the splendid medieval village of Monteriggioni, before the first White Road section begins (Section One: 2.2km, difficulty rating: 2-stars). After another 13km of asphalt, the second White Road section follows (Section Two: 2.1km, difficulty rating: 1-star). Perfectly straight and on the slightest of descents, this section is probably the least challenging of the race. 5km separate Sections Two and Three. Section Three is the first really difficult part of the race, a 5.9km sector rated 4-stars; it begins with a short, gentle descent, before ramping upward for a longer climb at a gradient of around 10%. The fourth White Road section begins at the village of Radi, 4.4km long and with a difficulty of 2-stars. Section Five starts immediately afterwards, in woodland, over less demanding gradients (Section Five: 5.5km, difficulty 1-star). Beyond Buonconvento lies the climb to Montalcino, the longest of the day (4km at 5%). After the descent that follows, the race joins Via Cassia, an ancient Roman road (now Strada Statale 2) for the feed zone (km 105 to 108) on the way to San Quirico d’Orcia. At Pienza, the sixth section of White Road begins. This 36km stretch of asphalt is the longest of the race (Section Six: 9.5km, difficulty rating: 3-stars), and begins with a climb over a rougher surface, leading to the village of Lucignano d’Asso, and then returning to asphalt roads towards Asciano. At Ponte del Garbo (Asciano, km 147), Section Seven of White Road begins; it’s the hardest of the race at 11.5 m and with a difficulty rating of 5-stars. Mostly climbing, it also comprises a number of abrupt ramps and hollows, especially on the roads around Monte Sante Marie, where the gradients are extremely high over short stretches. At Castelnuovo Berardenga, a very short stretch of flat White Road (300m) precedes Section Eight, beginning just after Monteaperti, which covers 800m and includes a steep ramp where the gradients reach double figures. Then, the route regains asphalt roads at Vico d’Arbia, and pursues them as far as Pieve a Bozzone, where the penultimate section of White Roads starts (Section Nine: 2.4km, difficulty 4-stars) on the climb up to Colle Pinzuto, with gradients of up to 15%. The final section begins at km 183.8 (Section Ten: 1.1km, difficulty 3-stars), with a sharp descent followed by a steep ascent (maximum gradient 18%) which finishes at the village of Le Tolfe. From there, 12km remain to the finish line at Siena's Piazza del Campo. The demanding final kilometers, with gradients up to 16%, approach the city of Siena along broad, straight sections of road, connected by sweeping curves, first descending, and then climbing slightly. 2km from the finish line, the route joins Via Esterna de Fontebranda, where the gradient touches 9%. 900m from the finish line, the race route passes beneath Fontebranda Gate where the road surface becomes paving slabs. The gradient exceeds 10% until 500m from the finish line, reaching its highpoint of 16% in Via Santa Caterina. A sharp right hand turn leads to Via delle Terme, and then Via Banchi di Sotto. With 300m to go, the road continues to climb slightly then, 150m from the line, a right turn leads into Via Rinaldini. The route enters the Piazza del Campo just 70 m from the finish line. The final 30m descends at a gradient of 7% and the finish line itself is flat. There’s a favorite for the 9th edition of the race: Fabian Cancellara who said, "I will be ready for the challenge on Saturday. This is one of my favorite races and I’ve already won it twice. I’m in good shape and, with no doubts, I will try to win for a third time thanks to the help of my teammates, which I’m sure will support me. This race, thanks to its course and its scenery, is certainly unique in the international race calendar”. Challenging Cancellara will be several Italian and overseas cycling champions that have performed very well at previous editions of the Strade Bianche, and in races that are technically similar. Peter Sagan, second in 2014 and 2013, is the big name. But we have to mention Nibali, Valverde (third last year), Stannard, Terpstra (who has great form from recent races), Gerrans, Vanmarcke, Moser (2013 champion), Nocentini (third in 2013) and Gatto (third in 2012). There will be now be 20 teams starting the race. The organization has invited the Italian national team, led by Davide Cassani, which will start with six riders.